John Gielgud was one of the towering figures of 20th century theatre, a man who cast shadows as actor, director, designer and producer on both sides of the Atlantic. His career, which spanned Edwardian times to the end of the 20th century, included not only stage work but accomplishments in the fields of film, television, radio and spoken word. Gielgud truly was a titan, and any writer attempting to sum up his life would be hard pressed indeed to do justice to it. 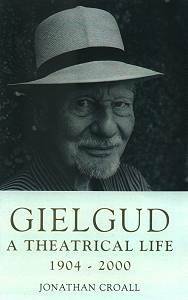 Jonathan Croall has taken on the challenge in GIELGUD, A THEATRICAL LIFE, 1904-2000, a biography published by Continuum (580 pages, $35). Croall, who comes from a theatrical family himself, did not have an easy time while writing the book. Not only did Gielgud waver in his support of it, but the author had to wage battle with a rival biographer (Sheridan Morley) who tried to undermine his efforts at every opportunity. Croall persevered, though, and the result is something for which every theatrelover can be grateful. Gielgud, A Theatrical Life is a triumph in all respects. Lucid, detailed and readable, it captures the essence of a man who achieved memorable things in his lifetime, yet remained modest, self-deprecating and even insecure, with a mischievous (and sometimes lethal) sense of humor. first; he nearly flunked out of acting school, and spent many years scraping by in rep companies that barely paid him enough to live on. His first starrring role was in Noel Coward's The Constant Nymph. At that time, British theatre served up mostly light comedies and musicals. Contemporary dramatic works had to get the approval of the Lord Chamberlain, who acted as a guardian of public morals. Young, idealistic theatre folk like Gielgud tried to get around the censorship by forming private theatre clubs, most of which performed on Sunday nights only. Gielgud also showed his mettle by rejecting the West End for a chance to join the Old Vic. It meant less money, but the chance to learn his craft, especially when it came to Shakespeare. His coach was Harcourt Williams, a man who looked like "a harassed bee-keeper," but who taught him much about the playing and speaking of Shakespearean verse. "He ruled us by affection and by the trust he had in us, a trust almost childlike in its naievete," Gielgud said. Gielgud himself was equally well-liked by his fellow actors. "His keenness, his modesty, his infinite capacity for work, spread their influence through the company," an associate recalled. Gielgud got a chance to play Macbeth ("isn't it lovely, the dear boy is blossoming," chirped his co-lead, Lilian Baylis), but it was his Hamlet that made him a star. The critics were stunned by this 26-year-old, slim, elegant actor. "His Hamlet is noble in conception," said one of them. "It has been thought out in study, and is lived upon the stage with the result that you feel these things are happening to Hamlet for the first time, and that he is, here and now, creating the words which shall express the new-felt emotions,"
After that, Gielgud never stopped working, right up until the age of ninety-six. As Croall notes, he ultimately took part in 130 roles in over 200 productions, appeared in over 70 films, 60 television plays, and innumerable radio plays, "and one of his last, King Lear, was on his 90th birthday." He directed over 80 plays, "was a pioneering actor-manager, and a great discoverer and nurturer of talent in others: innumerable actors, playwrights and designers owed their start in the theatre to him. He was also a elegant writer and witty storyteller who produced several entertaining volumes of memoirs and books on the theatre." One of his closest friends was fellow-actor Ralph Richardson, who called him a "kind of brilliant butterfly." Gielgud himself admitted that his feminine side sometimes took over on stage (his career survived a homosexual scandal), but he could also summon up the artistry to play such masculine roles as Lear and Julius Caesar with elemental, even ferocious power. Gielgud was a colossus of the theatre and this book pays him proper obeisance.